Recent research on agricultural innovation has outlined social networks’ role in diffusing agricultural knowledge; however, so far, it has broadly neglected the socio-spatial dimensions of innovation processes. Against this backdrop, we apply a spatially explicit translocal network perspective in order to investigate the role of migration-related translocal networks for adaptive change in a small-scale farming community in Northeast Thailand. By means of formal social network analysis we map the socio-spatial patterns of advice sharing regarding changes in sugarcane and rice farming over a period of five years. We find that, in translocally connected and mobile rural communities, a substantial share of advice originates from translocal levels. Translocal advice is dominantly provided through weak and formal ties with extension agencies and shared by few highly central larger-scale farmers within sparse local networks. This draws the picture of top-down translocal innovation flows driven by extension agencies and brokered through elite farmers. A closer look on institutional context and key actors of particular changes, however, suggests the potential of migration-related translocal networks and migration experience in fostering bottom-up innovations. Migration-related innovations transfers can promote adaptive capacity also among less favorably connected actors, especially if changes are geared towards limited household resources and are compatible with social practices of small-scale farming. We conclude that a translocal network perspective is instructive for research and extension interested in leveraging more inclusive agricultural innovation. The online version of this article ( https://doi.org/10.1007/s10460-019-09935-0) contains supplementary material, which is available to authorized users. This article is based on research funded by the German Federal Ministry of Education and Research, Grant Number 01LN1309A. The responsibility for the contents of this publication lies with the authors. We thank the numerous interviewees for providing insights in their agricultural activities and their sources of advice. In particular we thank our excellent research assistants, Pichapon Robru and Nootchanok Jitpakdee, for facilitating and translating interviews, and Raks Thai Foundation for organizational support. Ellis, F. 2003. A livelihoods approach to migration and poverty reduction. Paper commissioned by the Department for International Development (DFID). CiteSeerX. https://citeseerx.ist.psu.edu/viewdoc/download?doi=10.1.1.553.5678&rep=rep1&type=pdf. Accessed 13 Mar 2019. Mikhail, M., A. Fencl, S. Naruchaikusol, and E. Kemp-Benedict. 2010. Innovation and diffusion of sustainable agricultural water resource management in a changing climate: A case study in Northeast Thailand. Stockholm Environment Institute, Project report—2010. CAKE. 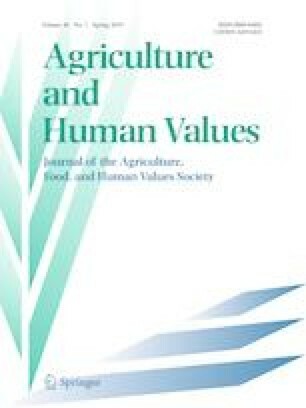 https://www.cakex.org/sites/default/files/documents/sei-2010-innovation-diffusion-agriculture-thailand.pdf. Accessed 13 Mar 2019. Naruchaikusol, S. 2016. Climate change in Thailand. TransRe Factsheet, Issue 2. transre. http://transre.org/files/9014/6859/1818/Climate_Change_in_Thailand_TransRe_Fact_Sheet_No._2.pdf. Accessed 13 Mar 2019. Promburom, P., and P. Sakdapolrak. 2012. Where the rain falls project. Case study: Thailand. Results from Thung Hua Chang District, Northern Thailand. UNU EHS. https://collections.unu.edu/eserv/UNU:1845/pdf10818.pdf. Accessed 13 Mar 2019.